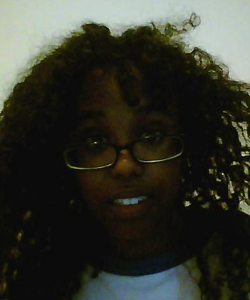 I am Somali and I have been struggling with my hair for ages, trying to comb it out, brushing it and braiding it. All in all, I haven’t been embracing my curly hair. When I finally read about the no-poo method, I was all for it. It's GREAT! My problem: while my hair looks significantly better than it ever did, my hair still remains frizzy. My curls do not stay defined and I can find tiny hairs sticking out all over the place. I attached a picture of myself. That is a picture of my hair semi-wet, and you can still see the frizz. The next day: Refresh with water and conditioner. I wash my hair every four to five days. By the end of the process, my hair feels as if there is so much product in it and very greasy. My hair is really not pleasant to the touch. And with all that product, I end up with frizzy hair. What am I doing wrong? What can I do to better define my curls and keep them frizz free with out so much product? First, I have to say you have lovely curls! Now as far as my recommendations, based upon what you told me, I would start first with cutting down the number of days you shampoo your hair. Clean hair is notorious for being frizzy because it doesn’t have any weight to help control the frizz. Second, I think I would suggest that you pick from either the coconut milk or the Garnier Fructis Sleek & Shine. Ultimately, too many products are going to cause the hair to feel weighty, and not pleasant. I think if you cut down the number of days you wash your hair, and add fewer products to your hair, you will find that the natural oils from your hair will aid in the definition and separation of the curls. Then whatever styling product you decide to use will only help the natural oils do the work to control the frizz. But, before you do all of this, I suggest beginning with a completely clean pallet of hair by shampooing the hair with a deep cleansing shampoo. Try Design Essentials Organic Cleanse Deep Cleansing Shampoo which will remove impurities from the hair and the scalp while leaving your hair’s natural moisture content intact. Now, I know I said above to minimize the number of days that you wash your hair, but starting a new product regimen off with a fresh clean head will allow for you to really see true results. Now, once you’ve washed the hair, follow by conditioning with an extremely moisturizing conditioner. You can try Design Essentials Stimulations Moisturizing Conditioner which is designed to replenish moisture from root to end. Apply this to damp, towel dried hair and comb through using a wide tooth comb to ensure maximum saturation. Leave this in the hair for up to ten minutes, then rinse with cool water to lock in all additional moisture. Then follow with your regular styling regimen and finish as usual. If you find that this does not work for you, try adding a smoothing styling gel which will cut down on frizzy hair, but add much needed hold. Good luck and please update me on your results!